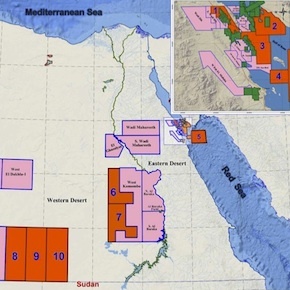 Egypt’s state-owned Ganoub El-Wadi Petroleum Holding Company (Ganope) issued a new international tender for oil and gas drilling and exploration in 10 sectors in the southern areas of the Western Desert and Gulf of Suez. Egyptian oil minister Tarek El-Molla stated Sunday that the bid includes five areas notably in West Gabal El Zeit, South East Ghara area, and South Sinai, in addition to another five areas in Egyptian Western Desert. The minister added that this is the second bid that oil sector issue during 2016 to attract new global investments to Egypt for oil and gas drilling and explorations. He noted that issuing bids and signing new contracts with global firms is the major factor in achieving Egypt’s strategy that aims at securing energy supplies sustainably to enhance economic and social development plans. South Gulf of Suez Blocks: Block 1 – West Gabal El Zeit (214 Sq. Km); Block 2 – South East Ghara (517 Sq. Km); Block 3 – East Geisum (541 Sq. Km); Block 4 – Sea Bird (241 Sq. 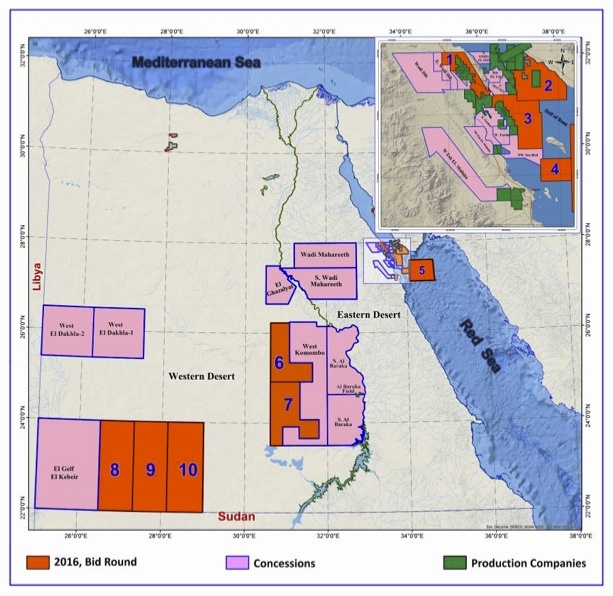 Km); Block 5 – South Sinai (3,115 Sq. Km). Western Desert Blocks: Block 6 – El Kharga (9,506 Sq. Km); Block 7 – South El Kharga (11,735 Sq. Km); Block 8 – West Mesaha (19,004 Sq. Km); Block 9 – Mesaha (18,974 Sq. Km); Block 10 – East Mesaha (18,950 Sq. Km). Minister El-Molla noted that the recently-achieved discoveries resulted from the bid issued by oil sector during the past two years besides inking contracts that made Egyptian oil industry attractive for foreign investments. Moreover, the minister clarified that the new bid is set to open the gate for new investments for oil and gas drilling and exploration in prominent areas in Southern Egypt. The tender is Egypt’s second this year, following an EGPC bid round as part of the government’s plan to encourage the growth of the petroleum sector. The plan includes tendering 30 oil and gas exploration blocks per year, signing 15-20 agreements over the coming period and boosting investments in the sector to USD 14 bn per year. The closing date will be Wednesday, November 30th, 2016 at 12:00 noon, Cairo local time.